One of my favorite songs to sing in my adolescence was a song by Dashboard Confessional entitled "Vindicated." Released to accompany a certain web-slinging soundtrack in 2004*, it seemed to quickly be adopted as an anthem by many angst-filled Tobey-Maguire-version-Peter-Parker nice guys. Besides, the song features such a distinct contrast between the brooding gloominess of the verses and the explosive indignation of the chorus that it just feels cathartic to shout out the word "Vindicated!" every time it comes around. So why do I mention this? Well, we experienced the great blessing in the Church's use of this word "Vindicate", not once, but TWICE in Her liturgical life today (three if we're being technical). With that being said, it's important that we get the word's meaning correct. Sure, countless road trips and jam sessions had me belting out the word "Vindicated," and while I knew it meant something like "avenged" or "revenged", I never fully understood the depth of its meaning growing up. In truth, vindication isn't just about the feel good act of clearing one's name, or screaming to the world how right you were. Yes, in the song, and in our everyday usage, that's what it often expresses at face value. But exploring its Latin roots, vindication means something much deeper. Formed by the combination of two Latin words vim (accusative form of the noun power) and dicare (a form of the verb to speak), we learn that "to vindicate", really holds the meaning "to speak power" or in other words "to show authority." Beautifully put, the meaning of vindication expresses a recapturing or re-presenting or restoring of the intrinsic authority that someone or something has, but for some reason had been taken away. It's like Simba reclaiming his rightful role as the Lion King. Asante sana, Squash Banana! To vindicate = To show to everyone the true power that something or someone holds. And that's why the Church uses this word vindicate in Her liturgy today. 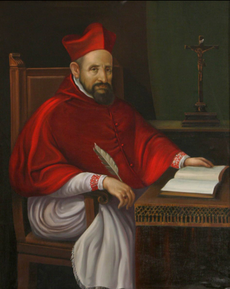 O God, who adorned the Bishop Saint Robert Bellarmine with wonderful learning and virtue to vindicate the faith of your Church, grant, through his intercession, that in the integrity of that same faith your people may always find joy. What does this prayer mean? It means that Bishop Saint Robert Bellarmine of the Society of Jesus, amidst the great challenges of the Protestant Reformation and countless attacks on the Church, stood in opposition to the world by assisting in the Church's vindication. In his writings against Protestant heresies, including the Disputations on the Controversies, and in his assistance in the development of Catechesis for the entire Church, St. Bellarmine fervently fought to restore the authority, dignity, and reputation of the faith of Holy Mother Church. Through the intercession of this holy man, the Church asks today that we all might find joy in this same faith that Saint Robert Bellarmine worked tirelessly to vindicate. As noted in Luke's Gospel, Jesus is warning against being moved by negative and dismissive societal attitudes toward Truth and those who bring Truth to the world. As a Christian, we are called to speak the Truth of Jesus Christ to the ends of the earth, and on this mission there will undoubtedly be those who dismiss the Truth, discrediting it, in the end failing to recognize true authority. Jesus assures us that in the end, wisdom will be vindicated by her children. And who are the children of wisdom? Us. As sons and daughters of wisdom we shoulder the responsibility, as did St. Robert Bellarmine, to vindicate her in this world. So, brothers and sisters, maybe today is a good opportunity to reflect on where we stand. Amid a world that constantly challenges us and the Truth we bear, in a world where others are dying in defense of their faith around the globe, what are we doing to vindicate wisdom? What can we do in our own lives, amongst our friends and family and acquaintances, to avenge the faith of Holy Mother Church and help restore Her authority to a world who is too blind to see it? Why are these important questions? Because, dear friends, quoting Nick Fury from The Avengers movie: "It's up to us."